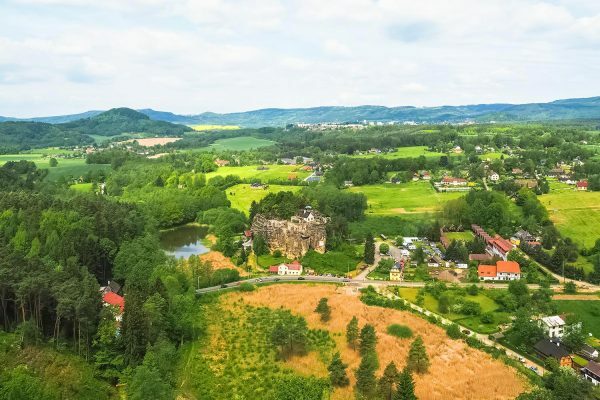 Sloup Castle is a small castle in the village of the same name in northern Bohemia. Its unique feature is its location: it is situated inside of a freestanding sandstone rock. 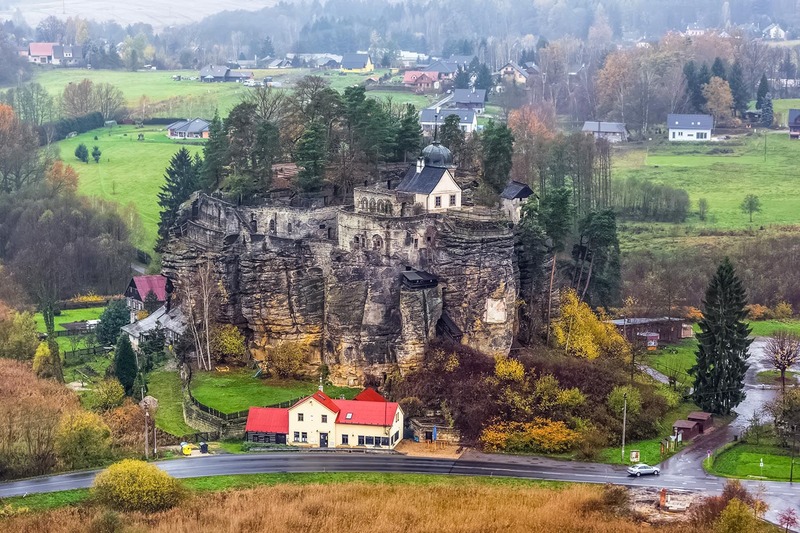 And this rock gave the castle its name because sloup means is Czech “column”. The full name of the village is Sloup v Čechách, which means “Sloup in Bohemia”. It should not be confused with the town of Sloup near the Moravian Karst in South Moravia. 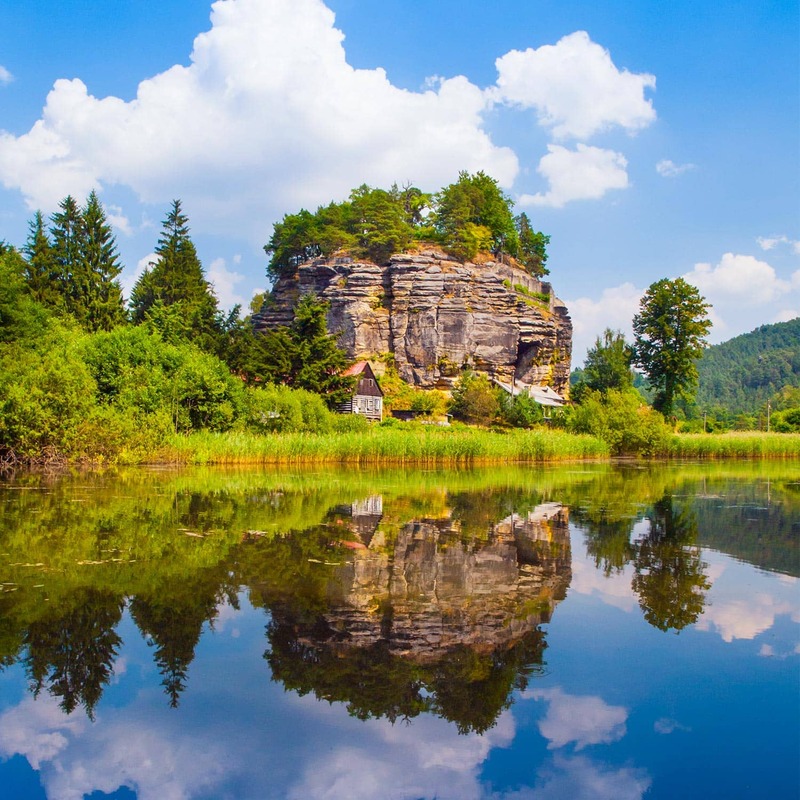 If you want to see this amazing rock castle, you must go to Sloup in the Liberec Region, in northern Bohemia. The castle was first mentioned in the first half of the 14th century. Throughout its history, it changed ownership many times. 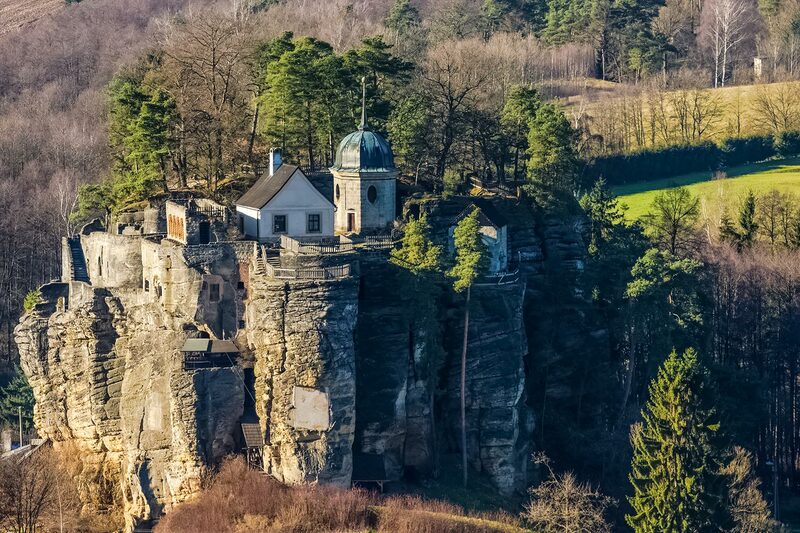 From the late 17th century till the late 18th century, the rock was inhabited by hermits. Nowadays, it is leased by its manager. The interior of the castle does not contain any works of art. Due to the centuries of decay, a more appropriate term for the site might be ruins. Nevertheless, it is generally referred to as a castle, even though the official website acknowledges that it is a catchphrase. The rock is approx. 100 m (328 ft) long and approx. 60 m (197 ft) wide. Its height is approx. 35 m (114 ft) above ground level and there is a platform on the top. The surface of the rock was carved in an attempt to make it resemble walls of a traditional castle. The top platform is open to the public and features a small church, or rather what’s left of it. Individual tourists and groups can visit the interior of the castle with a guide. The opening hours and ticket prices can be found on the official website of the castle. Wheelchair access is not possible for technical reasons. The village boasts another attraction: a lookout tower. It’s called Rozhledna Na Stráži. For a small entrance fee, visitors can admire an amazing, elevated view of Sloup Castle and a beautiful panorama of the picturesque surrounding region. Several prominent peaks can be recognized on the horizon, e.g. Ortel, Klič or Jezevči vrch. The easiest way to get to Sloup v Čechách is by car. The distance from Prague is approx. 117.5 km (73 mi) and getting there should take about 1.5 h.
But if you don’t have a car and you’re staying in Prague, getting to Sloup is not difficult, either. From Praha-Holešovice railway station (Nádraží Praha-Holešovice) you can take either a bus or a train to Česká Lípa. Once you arrive in Česká Lípa, you take one of the local buses to Nový Bor via Sloup v Čechách. The total journey time from Prague should be between 2 and hours, depending on the connection. Where to check the timetables online and plan your trip is covered in this article. Sloup is an interesting destination for a day trip from Prague. Perhaps not as popular as some other places around Prague, but certainly very unique.